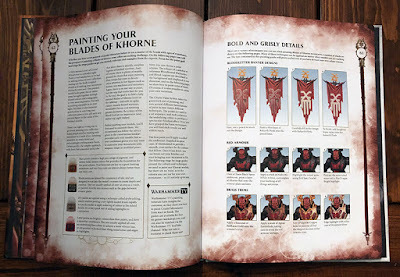 Khorne has been a prominent player in the Age of Sigmar since the game's launch, so it's no surprise that it is the second most updated Battletome right behind the Stormcast Eternals. So what's changed in the third and most recent iteration of the angriest of Chaos armies? 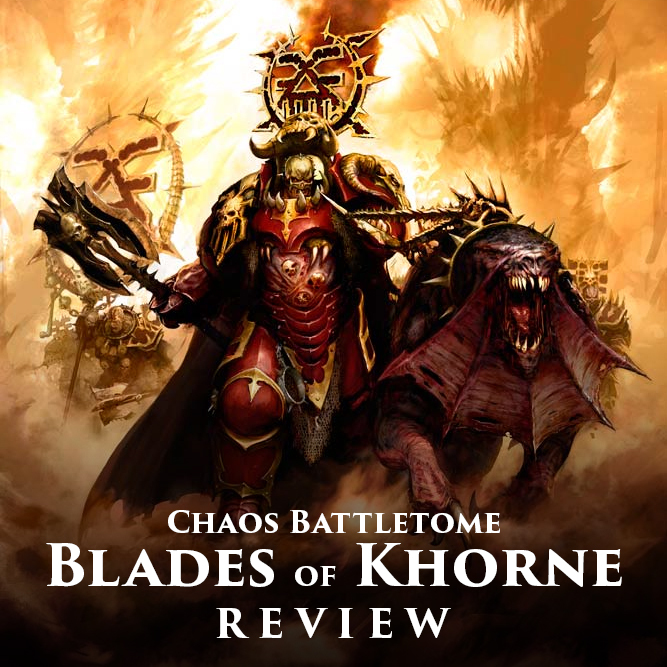 The cover for this is pretty cool, featuring the big bad, Khorgos Khul front and center. I do like that we're shifting some of the focus back onto him since I feel like he fell into the periphery a bit after the end of the Realmgate Wars. My only complaint on this is that it's an old piece of artwork reused again. This art has been around since the launch of AoS if I'm not mistaken. It's really cool looking though! 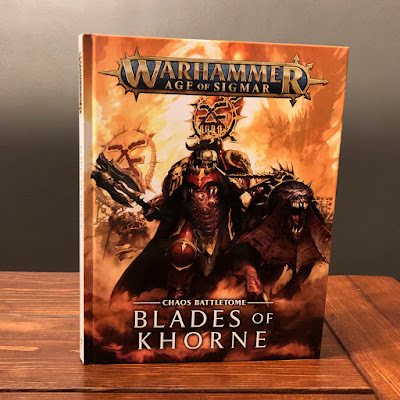 I'm a fan of seeing something new with each new Battletome and personally I would have liked to see some shiny new artwork for the Blades of Khorne. I think I like the cover of the previous edition a bit more as well, with the sinister Bloodletter on the cover, but I think maybe they're trying to shift the focus away from the demons and back to the mortals if this and the cover of Maggotkin are anything to go by. To start with, there's a lot on here that will be similar to what is in the last edition of the Battletome and what I covered in my review for that, as well as a bunch of new stuff. What makes it hard is that a lot of the new stuff are small tweaks or stuff only briefly touched upon before, and it's all interwoven with the existing lore, as it should be. I guess I 'll do a brief overview for those not familiar with the Blood God. Khorne is the chaos god of war, murder, blood, and skulls, and as such, all of his worshippers and demons are generally pretty angry and muderlusty all the time. When the Mortal Realms were first created Chaos didn't have any direct ways to interact with them. They were essentially cut off until they were "invited" in. As such, Khorne spent his time subtly stoking the fires of aggression in the tribes and people with an warlike inclination until they accidentally fell into the worship of Khorne. Once this happened that's when the door opened and Chaos was able to flood in. During the Age of Chaos Khorne prospered the most, to the point that after he had destroyed almost every meaningful civilization in the mortal realms, he then fell upon the forces of his brothers. Once they were sufficiently beaten back in most areas, his forces began to fall upon each other until the Stormcast made their appearance. I do think it's interesting that they mention the rivalry between him and Slaanesh, and the way it's described is almost as if he misses the Prince of Pleasure. You can't have a rivalry without your rival after all. There's also hints when talking about the gods usurping his position on top (he's got a bone to pick with Nagash now) that he hears a faint siren's call off in the distance. The largest change to the lore by far though is the ever advancing timeline. Khorne hates magic and wizards, so the culmination of Nagash's necroquake angered him to no end. Though he doesn't utilize the skeins of magic, the necroquake did weaken the fabric of reality enough that his servants can call upon the ire of Khorne in the form of his Judgements, manifestations of his wrath and displeasure upon the battlefield. The Bloodbound, his mortal servants, got a big update as well. One thing that always seemed odd to me was the lore of the Bloodbound setting up fortresses and strongpoints. This was linked to the Dreadfort scenery pieces, but just seemed off for an army as aggressive as the Bloodbound. Well, now that's been retconned a little bit. There are definitely still cases where fortresses are established, but it's definitely the exception rather than the norm. Instead, most Bloodbound armies are nomadic, traveling from one battle to the next, setting up only temporary settlements. This fits them a lot more and is something I can definitely get behind. Khorgos Khul, the face of Khorne in AoS, has had a bit of an update as well after the events of Malign Portents. The Orb Infernia has been transported back in time, robbing Khul of his floating kill planet, and putting it back in the hands of the Demons and Seraphon who were originally warring over it. Now he seeks to recoup the power he lost. I hope we see more from him in the future. 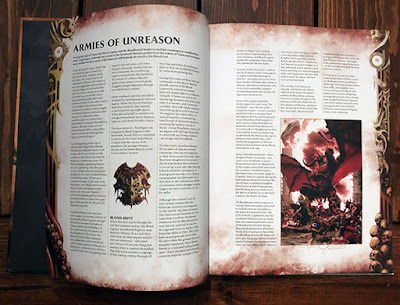 The timeline section goes over a lot of events we're already aware of, from the Age of Myth through the Age of Sigmar. We get to see how the Mortal Realms first fell to Khorne as well as the events of the Realmgate Wars and Malign Portents. There's a bit of crossover with the Nighthaunt Battletome where we see the forces of Khorne almost kill Olynder before Nagash and Arkhan intervene. Khul also now has to contend with challenges to his rule of the Goretide after his fall from favor, but he's not one to go down easily, as one of the new cities of Order learns to its dismay. The unit section in this book is broken up in an interesting way. 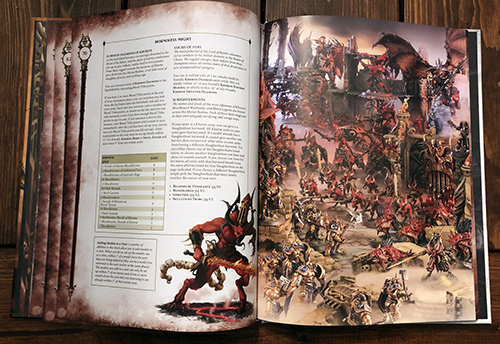 It starts off with the demons and open with a look at the Blood Legions of Khorne, in specific the two we get rules for in this book, the Reapers of Vengeance and the Bloodlords. The Bloodlords are Khorne's most preeminent legion, and only the most worthy of demons are allowed to serve in it. If a demon fails to prove its worth then it loses it place within the legion, motivating them to continually be the best. They also get the luxury of choosing where and when they want to fight, which is always against the hardest opponent they can find. Each of the demonic units gets its own little entry. One thing I think is interesting in this book is that the demons are given a bit more autonomy. 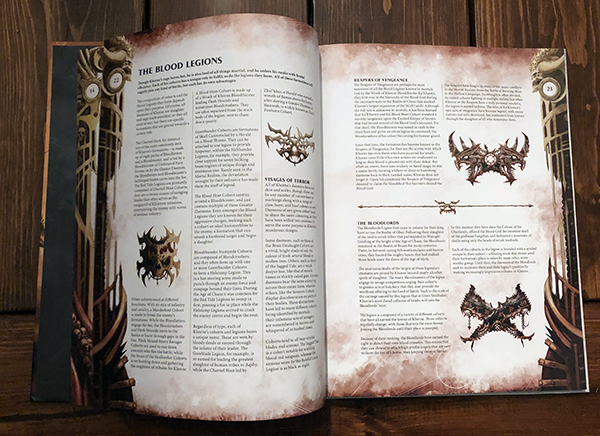 They are still said to be fragments of Khorne's power, but they make sure to emphasize that despite that each of them is an individual with an individual mind and personality. If they die they must return to Khorne's fortress in the Realm of Chaos through the back door, since the front door is only for those who are worthy. They then must prove their worth all over again or face a true death as they are reabsorbed back into their god. Skulltaker's entry is pretty cool in here too. He shows up in front of cities and fortresses demanding to fight their best champion. Then he patiently waits until they show themselves, at which point he duels them. There have only been three times when Skulltaker was unable to kill the champion he fought, one of which was Sigmar in the world-that-was. Once he claims the skull he burns their flesh from it and takes it back to Khorne to add to his throne. The skulls of the most worthy are given back to him, which he then clasps onto his cloak. 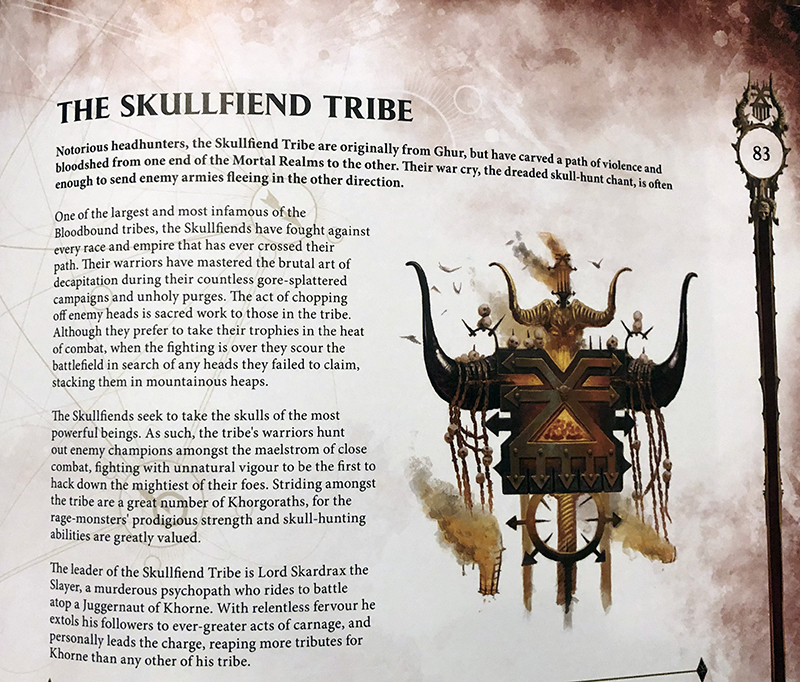 The mortal followers of Khorne get the same treatment, with the Goretide and the Skullfiend Tribe getting a deeper dive. The Goretide are Khul's personal Bloodbound army, and are the largest and most feared of all of Khorne's forces within the mortal realms. The Skullfiends wear black armor with red helmets and are even more obsessed with claiming skulls than most Khornate warriors. They originally hail from Ghur, but have recently sent a large portion of their tribe into Shyish to halt Nagash's plans. Though they failed they now find themselves fighting through Hallost, the land of dead heroes, a truly worthy challenge. Just like their demonic counterparts, each of the mortal units gets its own entry. The Blood Warriors, who were previously said to have gotten their armor from blood hardening over their skin, have gotten a slight retcon. 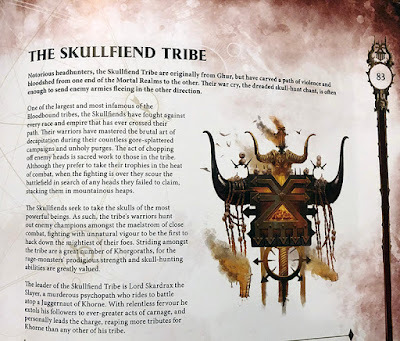 Now it says that it is rumored that is one way they get their armor, while others are said to venture into the realm of chaos and into Khorne's forges themselves. More or less I feel like they have taken some of the more outlandish and extreme elements of the lore, and tempered them a bit, brought them a bit closer to "reality". This helps the army feel more real to me, but also gives you options on what you want to believe as the truth. Some of the heroes who hail from the world-that-was, such as Valkia, Scyla, and Skarr, have retained their previous back stories, but now it doesn't really state what time they hail from. If you know they're from the world-that-was already then that link is still there, but now they're a bit more stand alone for people not familiar with Warhammer from before AoS, which is probably a good idea. 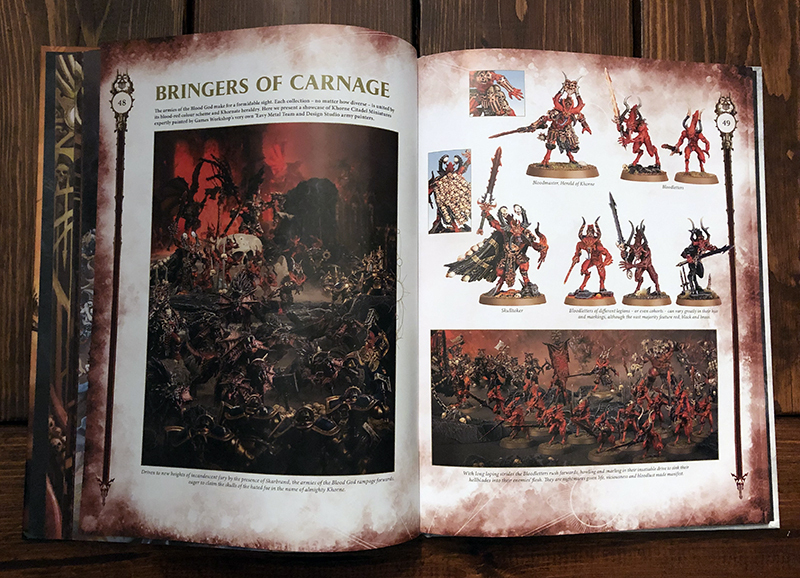 The painting section shows off all of the 'Eavy Metal models you would expect, with the new Skulltaker and Bloodmaster added in. Again, they're really hitting it out of the park with their new approach to the scenic shots. It really embodies the character of the army and looks much better than the "foggy background" that was so common in older books. There's also a painting tutorial section. This goes over a lot of the essentials with step by steps for red and black armor, brass, and a bunch of other stuff. The quality on these are really high actually. I'm glad that they're starting to show off more elaborate painting methods again. There's a few jokes hidden throughout as well. Now onto the rules. Quite a bit has changed, while also staying the same. The Blood Tithe points are still the main allegiance ability mechanic, but they've had a bit of a tweak. They're still accrued in the same manner where you earn one per unit destroyed on the table, your enemy's and your own, and are still spent in the same way. If you have four points stored up, and want to spend them on a reward that only costs two, then you lose the other two. The main difference is that the summoning table from the GHB is now incorporated into the book, and the rewards table has been changed and is better in my opinion. When you have Blood Tithe points you can spend them in either hero phase for a reward from the Rewards Table, or spend them at the end of your movement phase to summon on new Khorne demons. There are eight rewards to pick from, with each one costing 1 - 8 points, going up, so 1, 2, 3, 4, etc. 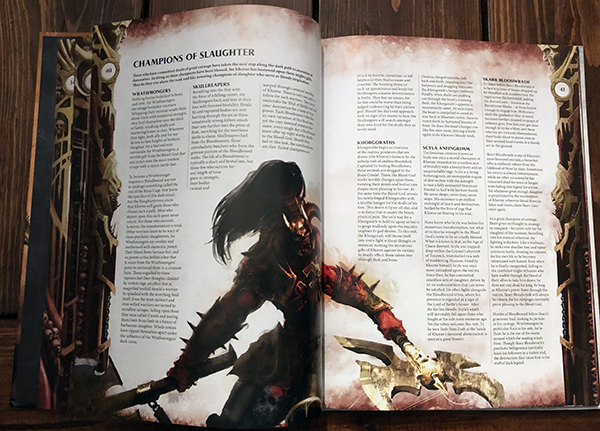 There are a ton of good options on here, from Blood Exemplar for one point which gives you a command point, to Slaughter Triumphant for eight points. This one is a once per battle effect, but once activated it stays in play. All unmodified hit rolls of six in melee generate two hits instead of just one for all Khorne units. That's pretty dang good. 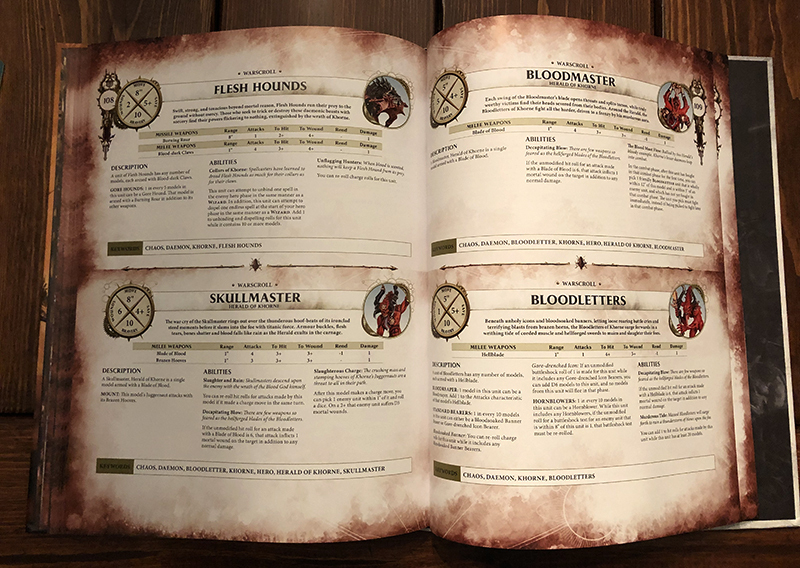 Crimson Rain is another great one, which allows you to heal D3 wounds on every Khorne unit on the table in your hero phase, and every one of your hero phases going forwards after it's activated. Spelleater Curse only costs you two points and lets you auto-unbind any spell on the table immediately after it's cast. The summoning is done in the same way as in other Chaos books, but costs you Blood Tithe points instead. These summoned units are set up wholly within 12" of a Khorne hero OR a Skull Altar. There is also the Locus of Fury, which is an army wide rules where you can re-roll hit rolls of 1 for Khorne Demon units wholly within a certain range of a Khorne Demon Hero, and a slightly larger range for Greater Demons. Just like in the previous edition of the book there are three sets of command traits, one for mortal heroes, one for Bloodbound, and one for demons. All three of these share the same first three command traits, but then each also gets three unique ones. 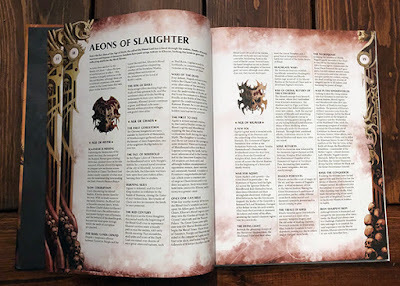 Slaughterborn, one of the ones available to all of them, would be great on a Bloodthirster since it lets you re-roll all hit rolls. Another one gives you a bonus Blood Tithe point if your general kills a hero, and there's one for demons that turns your weapon's damage into mortal wounds on an unmodified wound roll of 6. More or less all of these buff the effectiveness of your hero in combat, which is only fitting for a hero of Khorne. 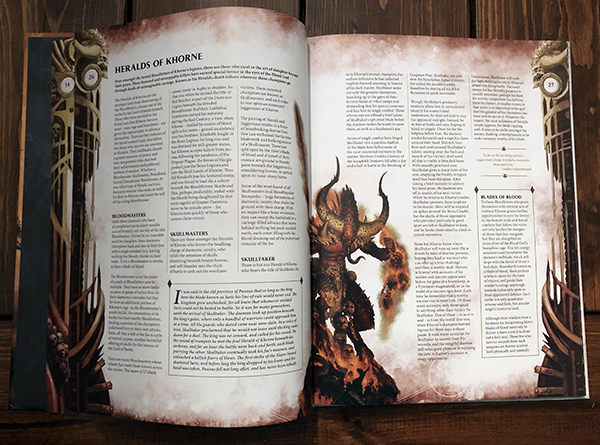 There's also a set of artifacts for mortals, Bloodbound, and demons, and an additional set of weapons for demons and three banners for your Bloodsecrators. 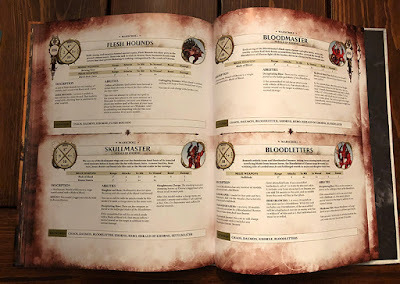 The Banner of Blood, for instance, lets all friendly Khorne units wholly within 12" re-roll their charge rolls. That's pretty good since it will save you some command points. Again, all of these pretty much just boost the combat effectiveness of the hero, with a few helping out the rest of your army as well. You have six prayers to pick from for your Slaughterpriests. I had a hard time picking out a standout from these since they are all pretty good! Bronzed Flesh adds 1 to the save of a friendly unit, while Killing Fenzy adds 1 to hit for a friendly unit. The ubiquitous Blood Sacrifice is still there, so don't worry, you can still farm your own Bloodreaver units for Blood Tithe points if you want to. There's also the addition of the new Judgements of Khorne. This is basically their version of the Endless Spells. These are summoned on through a prayer roll, a different value for each one, so they cannot be dispelled or unbound later. To balance it out though, you must roll for each Judgement on the table at the end of each Battle Round. On a 1-4 they are removed, though you can add 1 to that roll for each Khorne Priest wholly within 8" of the Judgement. So more than likely they'll be a bit shorter lived than the Endless Spells. The Blades of Khorne also get their own scenery piece now in the form of the Skull Altar. This is set up in your own territory like a lot of the other army specific scenery pieces. All Khorne Priests wholly within 8" of it can re-roll the dice for prayers and Judgements, and all wizards are at -1 to cast of they're within 16" of it. You can also summon demons near it, as I mentioned earlier, and at 0 points there's really no reason not to take it. What were previously battalions that you had to pay points for in the last edition of Blades of Khorne are now free to take, just like with the Stormhosts. 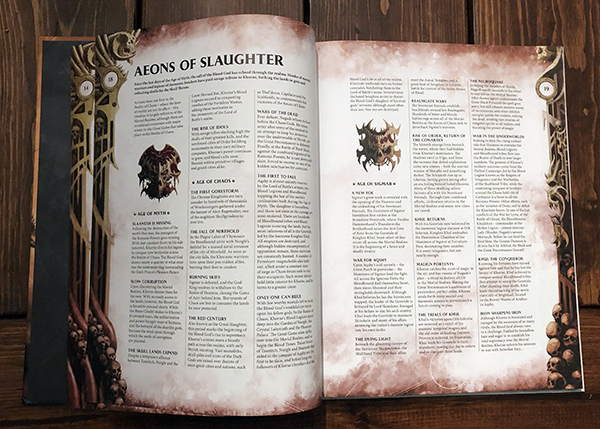 There are four different Slaughterhosts that you can align your army too. 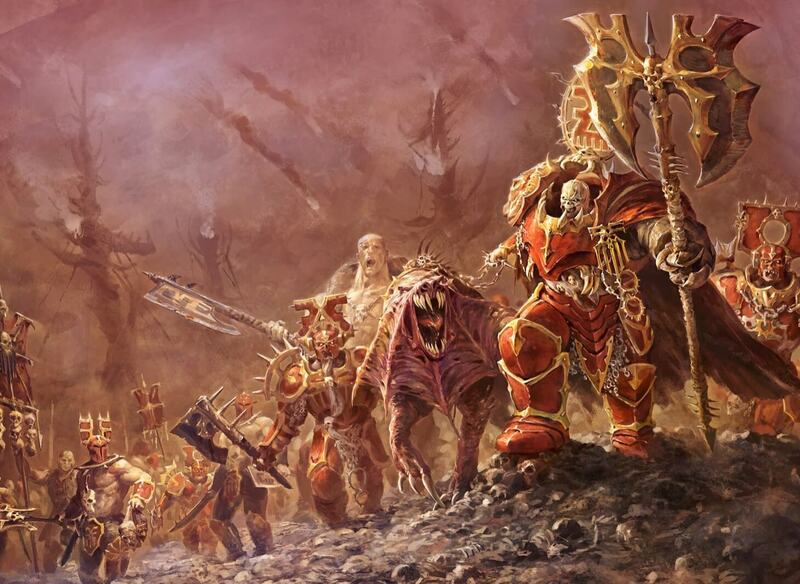 The Reapers of Vengeance and Bloodlords boost demon units, while the Goretide and Skullfiend Tribe boost mortal units. This doesn't preclude you from doing a mixed army though with one of these Slaughterhosts. If you take the Bloodlords for example, and have a mix of demon and mortal units that's perfectly fine, only the demon units will really benefit from the bonuses though. All four of them are pretty good to be honest. The Bloodlords will combo really well with the Tyrants of Blood battalion due to the Halo of Blood artifact. The Halo of Blood allows your hero to attack at the start of the combat phase before anyone else. The Tyrants of Blood battalion allows you to attack with all of your Bloodthirsters, one after another once the first one has attacked before your opponent goes. So you attack with the Bloodthirster with the Halo artifact at the start of your combat phase, which then triggers all of your other Bloodthirsters from the battalion to attack before anything else gets to go. The Goretide is really cool too, since your mortal units get to re-roll wound rolls of 1 if they're within a certain distance of an objective. That's a really unique ability I don't think I've seen before. Their command ability also allows you to pick one unit and they can auto-run 6 and run and charge as well. Plus, the artifact you're required to take is essentially the Ethereal Amulet. So, it's good all around! 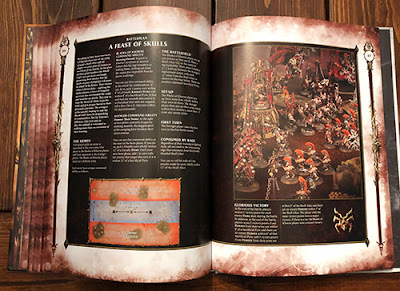 There are two battleplans in this battletome, and they really embrace the narrative element of the game. 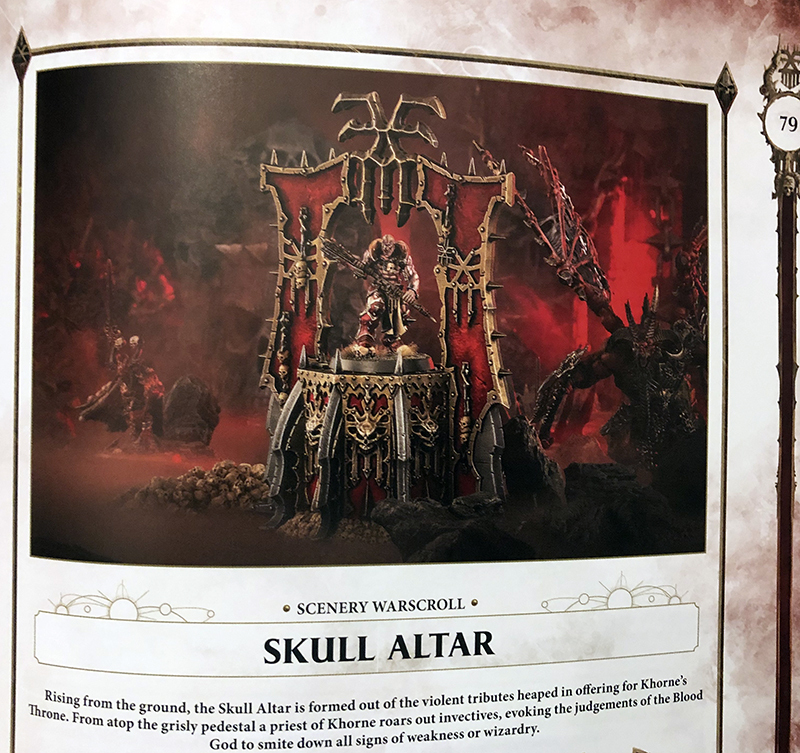 The first, The Bloodstorm, has the Khorne player build a Skull Altar right outside an enemy fortification. This Altar is summoning a bloodstorm, which threatens the defenders, even behind their walls, forcing them to venture out to destroy the altar, just as the Khornate forces want. Basically you have to try and destroy the altar or defend it. It's really cool sounding and is something I would love to try out. The second one has the Khorne forces acting as the defender as the attackers look to recover their dead from a previous battle which are now being burned in giant pyres in glory to Khorne. The Path to Glory section is also here, with everything you would expect from it. 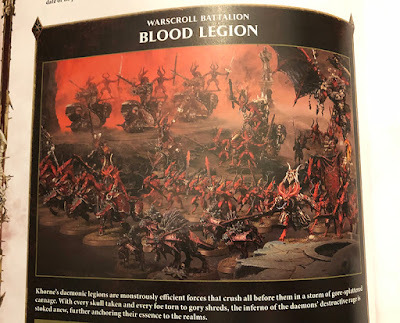 As is fitting for Khorne, there are 8 battalions that focus on demons, and 8 that focus on mortals, with an additional mega-battalion for each. I've already talked about the Tyrants of Blood, which is Bloodthirsters and I think will be a stand out choice for a lot of people. Most of the rest have gotten small tweaks from before, more often than not they've been simplified and streamlined a bit. The Murderhost for example now adds 2 to the run and charge rolls for its unit within range of the battalion hero. I'm sure the Gore Pilgrims will still be taken a lot since it still boosts the range of the Bloodsecrator's banner, which is a pretty big buff. I also like the Bloodforged, which is the Wrathmonger battalion. If a unit of Wrathmongers is wholly within 8" of the battalion's Skullgrinder then they can immediately pile in and attack for a second time in the combat phase. All of the unit warscrolls have been changed in some way or another, and since they're in the App for free I'm not going to spend a lot of time going over them. I personally think everything has gotten better. That doesn't mean they're all more powerful, I just think it's a more balanced spread of units which will hopefully mean we see more varied lists on the table. A lot of stuff got streamlined to make the game go faster, like Wrathmongers which now just inflict a number of mortal wounds on the enemy when they die instead of making the enemy attack itself. The Skullreapers are also greatly simplified, which will just make using them a lot easier. 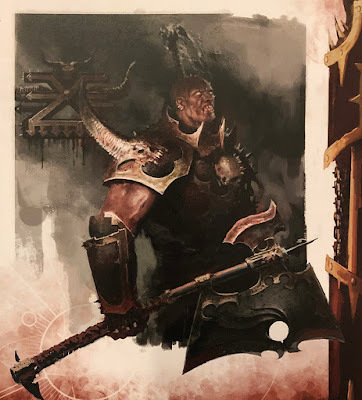 I also think Khorgos Khul has gotten a bit of a buff which finally makes him a worthy consideration over a normal Mighty Lord of Khorne. Both of the Warhammer Underworlds warbands are included in here as well. Lastly, we have the three new Judgements of Khorne. The Hexgorger Skulls are great for dealing with wizards, subtracting 2 from casting attempts when they're nearby, and potentially making the wizard forget the spell if they roll an 8 and then dealing out mortal wounds on top of that. If you have these near a Skull Altar that's a -4 to cast. The Wrath Axe is an absolute mortal wound machine. Since these can't be controlled by the enemy player you're 100% safe in having this move where you want it to. 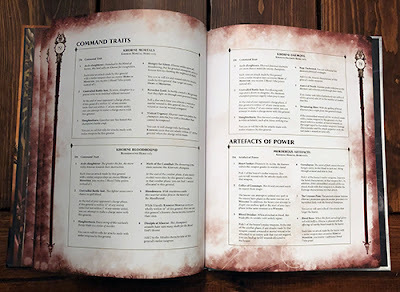 There's a ton of new content and updated rules in here compared to the last edition of the Battletome. I think you can really see how the game has evolved since then, both on the table and in the background. If you're a Khorne player then I'm sure you're already planning on picking this up, but if you're thinking about dipping your toes into the blood for the first time, there's never been a better time than now. Blood for the Blood God! Skulls for the Skull Throne!